We are delighted to announce that Anukampa Bhikkhuni Project signed a rental lease on 29th November, for a three-bed terraced property in Oxford- our first temporary "Bhikkhuni Residence." This pivotal step is the outcome of three years of dedicated hard work, and the many beautiful new spiritual friendships that have developed through serving in Dhamma together. 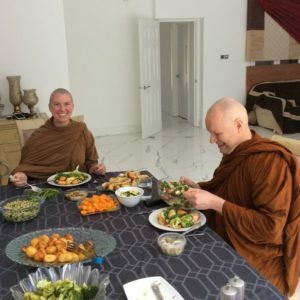 It is a historic first to have a designated Bhikkhuni Residence in the UK, and so we are very inspired and excited! Ven Canda will be in residence from mid-January until the end of June, 2019. Anukampa Bhikkhuni Residence is a private dwelling, and not a community centre or a public place of worship. We are therefore not holding any formal public events in the Residence (and will instead be looking to rent alternative venues for any public events we might do). The aim of renting a property for five months is an important stepping stone in the development of a permanent "Forest Monastery" in the UK, and will help Anukampa foster strong local support as well as provide a base for Venerable Canda. 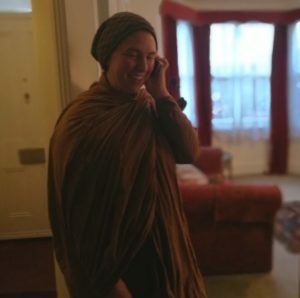 We would very much like to give our supporters the wonderful opportunity to practice generosity (dana) by offering meals and/or other requisites and household items to Venerable Canda, whilst she is in Oxford. There are various ways of doing this, whether you live locally, or far away. You can find a list of needed items and further information on participating in the daily meal offering, below. There is also the possibility for supporters to stay at the Residence for short periods on an invitation basis, or join Ven Canda for meditation and Dhamma Discussion by prior arrangement. If you are interested and would like more information, please email us at team@anukampaproject.org. Generosity lies at the heart of the Buddhist Path and is the foundation for inner cultivation. The type of giving that yields most benefit are gifts offered with a serene, joyful heart for the purpose of "beautifying" and "equipping" the mind (with stillness and wisdom) AN:8:31. Since the time of the Buddha, monastics and lay people have been practicing generosity through a relationship of inter-dependence, which creates a sense of respect and reverence to all life. This system also works beautifully to promote selfless giving as part of letting go. Lay practitioners support virtuous monastics with material requisites, so they may dedicate their life to Awakening, whilst monastics share their wisdom and provide spiritual sanctuaries (otherwise known as monasteries!) to help and inspire their supporters to deepen their Buddhist practice. Bhikkhunis are not permitted to handle money or cook for themselves. They train to practice contentment with only what is offered. A nun cannot ask for anything without an invitation being made. Additionally, a nun can only eat between dawn and noon (or 1pm in British Summer Time). 2. By offering something on a regular basis e.g a meal, a veggie box, or a standing order. 3. By inviting the resident nun to let you know if there is something she or the Residence needs. In the third case, it is helpful for us to know how long your offer stands and the approximate value you are considering, (e.g. an offering of up to £30, any time in the next two months). If you would like to offer a hot meal, please have a look at our Food Dana Calendar here, then contact us by email or phone to make the arrangement. Please note that all food should be prepared without garlic and chilli. You are also very welcome to bring food at any time for the pantry store, and you can also bring food in the evening for the following day's meal. Please take a look at our Needed Items List here, then contact us by email to arrange a delivery/visit. Depending on her schedule, Ven Canda also accepts invitations to private homes or restaurants, and will occasionally go on alms round in Oxford with her bowl. For those living further afield, you can order a one-off or regular food box delivery or a ready-made hot meal- your choice! Again, please check our Food Dana Calendar and Needed Items List before contacting us to make the arrangement. For other items, including those listed above, please see our Needed Items List here. Please contact us by email to let us know you wish to make the gift. If you would like to make a general offering, you may choose to offer a gift voucher, or invite the Resident Bhikkhuni to say if there is anything she, or the Residence, needs. Whilst one-off donations are always appreciated, now that we have a regular expenses, standing orders are particularly helpful in allowing us to plan ahead. All donations of any size are gratefully received. HSBC Bank plc, 54 High Street, Epsom, Surrey, KT19 8DS, United Kingdom. Anukampa Bhikkhuni Project, Aspen Cottage, 83 The Green, Epsom, Surrey, KT17 3JX, United Kingdom. If you would to donate using a credit card or via PayPal, please go to our donations page here. "Bhikkhu(ni)s, in three cases one may be understood to have faith and confidence. devoted to charity, delighting in giving and sharing. In these three cases one may be understood to have faith and confidence."